Hurley, M. M., Dennett, D.C., & Adams Jr., R. B. 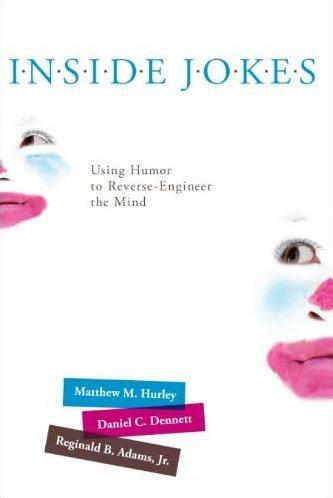 (2011) Inside Jokes: Using Humor to Reverse-Engineer the Mind. Cambridge, MA: MIT Press. Having a sense of humor is a universally human trait, yet rare or non-existent in the rest of the animal kingdom. It's expression, laughter, is a curious form of communication, not unique in style (compare crying, sighing, gasping and expressions of awe) but strange nonetheless. There is vast diversity in the things that make us laugh. Punning and slapstick are, somehow, in the same category as cartoons, situation comedy, witticisms and comic insults. And all of these are the drivers of a billion-dollar industry of theatre, television, cinema, and standup. The reason we have such an industry is clearly that we enjoy humor but . . . why should we enjoy it? This is one of many vexing questions about humor and mirth. Why should such a broad category of experiences all feel good in the same way? In Inside Jokes, we identify twenty questions that a humor theory should be able to answer, ranging from the cognitive mechanics of humor to the emotional motivations for it, to the social uses of the trait, and the cultural elaborations upon it. We might ask why a joke's success depends so crucially on timing, why the setup-then-punch structure is important--what does it mean to be "set up"?--and why jokes always seem to have butts. We might also ask why jokes exist at all; there is no analogous type of packaged comment that is used to make people sigh, cry or sneeze. One might also wonder what the relationship between humor and riddles is. How about caricatures? And, what is tickling—why does such a bizarre behavior, which only others can do to you, have a response that seems so related to that of humor? And, of course, there is the question that has led the way for most philosophers of humor so far: What are the necessary and sufficient conditions for a thing to be funny? What is the essence of funniness? In Inside Jokes, we've used a simple framework that rests upon existing theory in psychology and cognitive science to give answers to all these questions and many more. It certainly won't be the end-all of scientific inquiry into humor, but my coauthors and I think it is a significant advancement over the previous theories. We provide an evolutionary explanation of the cognitive and emotional factors that create basic humor and we supplement that with discussion of cultural and cognitive elaborations that turn the base metal of humor into the gold earned by the modern comedy industry. There is an Inside Jokes website, where you can read more about the book, find independent reviews of it, and find out how to buy it. Hurley, M. M. & Rastogi, N. S. (2011) "5 Leading Theories for Why We Laugh—and the Jokes That Prove Them Wrong" Brow Beat: Slate's Culture Blog (Slate.com), May 13, 2011. Hurley, M. M., Dennett, D.C., & Adams Jr., R. B. (2011) "Q&A with James Garvey" The Philosopher's Magazine (tpm). Issue 53, 2nd Quarter, 2011, p114-115.